How Will Gold Hold Up in the Next Financial Collapse? Coming up we’ll hear from Michael Pento of Pento Portfolio Strategies and author of the book The Coming Bond Market Collapse: How to Survive the Demise of the U.S. Debt Market. Mr. Pento shares his thoughts on debt bubbles, how the next collapse will compare to the last one, and what he views gold’s role will be during all of it. Be sure to stick around for my exclusive interview with Michael Pento coming up shortly. To hike or not to hike? Sooner or later? Inquiring Fed watchers want to know. But perhaps the more important question is: Does it really even matter? On Wednesday the Federal Reserve released minutes from its April meeting. Comments from Fed officials tended to reinforce investor expectations that the Fed won’t raise rates at its June meeting. And given the weak economic reports on trade and retail sales since the Fed last convened, there’s little chance the Fed will find new reasons to raise rates in June. So it appears that Fed watchers will spend this summer contemplating the odds of a rate hike in September. Or maybe later. Or maybe not at all. Maybe there are more important things to focus on than the ruminations of central bankers. We certainly thing so. After all, as our guest Jim Rickards pointed out several weeks back… Fed governors don’t have a clue -- and they’re just making it up on the fly. In any event, gold and silver markets were little changed after the release of the Fed minutes. But they both sold off earlier in the week, giving up a good portion of their big gains from last week. Gold prices entered trading Monday on the verge of breaking above the key $1,225 technical barrier that Dan Norcini and I discussed on last week’s program. But gold couldn’t manage a close solidly above that level. Prices then fell back down near $1,200 an ounce. On the plus side, gold prices did hold above $1,200 through Thursday’s close. And is still doing so as of this Friday morning recording. The yellow metal currently trades at $1,204, down 1,7% on the week. As for the silver market, prices currently come in at $17.09, for a weekly decline of 2.5%. The platinum group metals also are also losing some ground, with platinum down 1.9% to trade at $1,147 an ounce, while palladium is off 2.5% to come in at $775. All the precious metals struggled against a sharply rising U.S. dollar. The Dollar Index surged 2.5% by mid week. And the stock market climbed back up toward record highs. On Wednesday, four powerful multinational banks agreed to plead guilty to criminal charges of market rigging and pay approximately $5.7 billion – yes, billion! – in collective penalties. The unprecedented punishments were imposed by the Department of Justice, the Federal Reserve, and European regulators. According to the charges, currency traders at JPMorgan Chase, Citigroup, Barclays, and The Royal Bank of Scotland conspired with one another to fix rates on the global currency market. These rogue traders formed a group they called “The Cartel” to share confidential client information and orchestrate their attacks. Loretta Lynch: Currency traders at several multi-national banks formed a group that they dubbed "the cartel". It's perhaps fitting that they chose that name as it aptly describes the brazenly illegal behavior that they were engaged in on a near five year basis. Almost every day for more than five years traders in this cartel used a private electronic chat room to manipulate the spot market's exchange rate between euros and dollars. Their actions inflated the banks’ profits while harming countless consumers, investors and institutions around the globe from pension funds to major corporations, and including the banks’ own customers who placed their faith in the market and relied on it to produce a competitive exchange rate. That was Attorney General Loretta Lynch. What she didn’t mention is that the unprecedented sets of fines imposed on these banks will ultimately come at the expense of shareholders. The actual criminal perpetrators of the fraud scheme will, naturally in keeping with recent history, avoid criminal liability. And the big banks will go on pursuing their agenda of imposing a fully electronic cashless economy. The so-called Better Than Cash Alliance is an alliance of financial companies, government agencies, and NGOs that aims to abolish cash transactions. Citi is a member of the Better Than Cash Alliance, as are agencies of the U.S. government and the United Nations. If this cabal gets its way, then it will be difficult for anyone to break free from the banking system. It could become impossible to take withdrawals in cash. Those who want to purchase anything directly without going through an electronic banking intermediary will have to learn how to barter. Perhaps the war on cash will generate a backlash. And perhaps it will trigger a renewed interest in gold and silver coins as real, tangible money that exists outside the financial matrix. Of course, the futures markets for gold and silver have become heavily “financialized.” Rogue traders at various commercial banks are implicated in the manipulation of precious metals markets. In an article posted at MoneyMetals.com this week, watchdog Seth Mason exposes how the gold futures market trades with a consistent bias to the downside in the U.S. even when prices are trending higher. You’ll want to check that out if you haven’t already. And now, for more on the war on cash and other financial matters, let's get right to this week's exclusive interview. Mike Gleason: It is my privilege now to be joined by Michael Pento, president and founder of Pento Portfolio Strategies, and author of the book, The Coming Bond Market Collapse: How to Survive the Demise of the U.S. Debt Market. 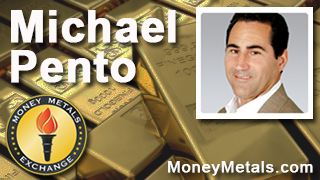 Michael is a money manager who ascribes to the Austrian school of Economics and has been a regular guest on CNBC, Bloomberg, Fox Business News among others, and we're excited to talk to him again today. Michael, thanks very much for speaking with us and welcome back. Michael Pento: Thanks for having me back Mike. Mike Gleason: I definitely want to get into the war on cash with you here in a little bit, but first, you've been quite critical and outspoken about the Fed and its policies, so, we've had an extended period of low interest rates and overall easy monetary policy and at the end of the day, what has that gotten us? Michael Pento: Not much of anything. The GDP is averaged 2.2% since 2010, I know the Wall Street carnival barkers like to always explain that we are about headed to escape velocity in the economy, but there's been no entries in the rates of GDP growth since the great recession ended, and now the dangerous part is they're looking to blame the weather of snowier winters in the context of global warming. Looking for any excuse to revise higher, the first quarter even though the first quarter has been higher than Q2 40% of the time in the last 10 years, but that's prima facie evidence that they should undergo some dramatic change to the formula that the Bureau of Economics Analysis conducts. The danger here is I think we are going to get more and more government data that's manipulated right from the onset of its release. Mike Gleason: Ultimately what do you think the market reaction will be to all of this, because it seems like it will have to unwind at some point, right? Michael Pento: We are in an epic bubble, if you look at the Q ratio which is really the total Market Cap divided by the replacement cost or book value of companies, it's vastly at all-time high outside of 1999 or early 2000. You're looking at total Market Cap as a percentage of GDP the same story, we are 127% where the median is at 88%. If you look at the median P/E ratio on the S&P 500 is higher than 99% of all other occasions, so we're a monstrous bubble in equities and this is not only in the United States but extends especially to China and Japan. Of course in Europe we have negative real interest rates, and sovereign debt across the globe, we have negative nominal rates in even Portugal, of all places. The Portuguese had a six month T-BILL trading at 11% in 2011, which was actually the vote on the part of the bond market that Portuguese people, the tax bace, was incapable of servicing Portuguese debt. So interest rates spiked to 11% for a very short term debt not because Mario Draghi came in, and uttered the words “whatever it takes”, and, guess what, yields in nominal terms are negative. So you're looking at a massive bubble in stocks, a massive bubble in real estate, a re-ignited bubble there, but also unprecedented global international bubble in sovereign debt, and when that pops is going to make 2008 look like a walk in the park. Mike Gleason: What does this mean for gold? One would think it would generate more demand for it, no? Michael Pento: They just had a report yesterday that, I think it was six banks across the planet were fined billions of dollars for manipulating LIBOR, the London intra-bank offered rate, for manipulating currencies, for manipulating S&P mini futures, for manipulating everything. And that included commodities, so gold is a very highly manipulated commodity, because it reveals the fact that governments are insolvent and the currencies are worthless, so there is a vested interest on from governments and financial markets to keep this metal down. If you're moving towards a cashless society, and I know you wanted to get to that later, but if you move to a cashless society, I think you'll have such an overwhelming demand for gold, from the private economy, that it would overwhelm and supersede any type of manipulation from banks and governments. Mike Gleason: Has the lack of safe haven buying of gold to this point surprised you a little bit Michael? Michael Pento: Yes as a matter of fact it has, I'm so surprised by so many things Mike. If you told me that the debt of the world would explode by $60 trillion since December of 2007, if you told me that nominal interest rates was going to be pushed to zero by central bankers across the globe, I have to add also, if I told you that every central bank on the planet has adopted inflation targets, I would have told you that gold would be $2,000, $3,000 or $4,000 an ounce. But, because it's manipulated it's been artificially suppressed down here for much longer than I would have believed, but I guess that's good news because people who want to buy it can buy it much more cheaply. But that won't last for long in my opinion, especially as the confidence in the central bankers finally erodes and withers away to zero. Mike Gleason: The war on cash is something we've been covering over the last month or more as things have really been heating up on that front and I know you're quite concerned about what's happening there too, what are government officials and central bankers attempting to do here by giving people zero or negative interest rates, at the same time they're trying to herd them into holding cash in the bank. Michael Pento: Well, what they're trying to do, is they're trying to get an inflation target reached, and it's been difficult for them to achieve this inflation target. First of all, the way they measure inflation has been so convolutedly changed since 1980, because of the Boskin Commission. I don't want to get much into the wonky weeds here by describing to you how they under-calculate and under-estimate the rate of inflation but the rate of inflation should be much higher than it is today if you calculate it in real terms. What they wanted to achieve is the 2% inflation target, they have 1.8% inflation if you look at the coal rate, because oil prices collapsed now they're down to barely a positive year over year change in consumer price inflation. But here's the thing, they want to get inflation much higher, and the reason why, I believe they want to get the inflation higher is because they know that the nation is insolvent, not only United States, I'm talking about China, I'm talking about Europe in general, and I'm talking about Japan especially. And in order to make this government payments solvent they're trying to engender a massive amount of inflation much north of the stated 2% target. Now the only way they can do that is by spending money supply, and that's been very hard to do under the current laws that are in place, because a central bank cannot directly monetize government debt, they have to use the private financial institutions as a conduit. So what they've done is that they've taken interest rates down to zero, they have engaged in massive quantitative easing, but the consumer is what I call “debt disabled”. Their debt as a percentage of income is still way above historical measures. It's about 88%, it's usually around 40%. So what do they come up with now? Negative nominal interest rates. Now if I told you that your deposit rate would be minus .01% you might not care. If you have a $1,000,000 in the bank or even just a couple hundred thousand in the bank, you might say well “you know what, it's not very convenient and very risky for me to put all this cash under my mattress, so I'll keep it in the bank at slightly negative interest rates”. But, if banks took the interest rate, the nominal interest rate, not after inflation, the nominal interest rate to minus 10%, what would occur? I would take all my money out of the bank immediately, because I'm not going to lose 10% of that value. I'd rather hire an armed guard to patrol my mattress, it will be cheaper, so what's the headache for? So what they're trying to do, is go to a cashless society and if you have a total abandonment of cash, all over the globe, it prevents you from doing that, it prevents you from taking your money out of the bank, you can't take money out of the bank because it will all be electronic. And then they can take total and absolute control of the money supply. They can make interest rates as negative as they choose, and in that case money will become a hot potato, you'll have to spend it as soon as you get it, the money supply will boom, of course if I'm getting a negative 10% on interest, then I become very much favorable as a borrower as opposed to a lender. So you have a massive increase in velocity, and a massive increase in money supply, and then you have the real problem because inflation will run way out of control. And the only way you can preserve your wealth in that case will be to hold precious metals. Mike Gleason: Expanding on that, you touched on it there, but what should the average person who is listening to this be thinking about. Where are they going to go for financial safety given all of these headwinds? Michael Pento: Before I go into that I just want to tell you that because of the condition of the economy, I will tell you that you can't go and buy sovereign debt. 24% of Americans have more credit card debt than they do savings. This has become a part time economy there's 2.5 million more part time workers today and there's 2.2 million less full time workers, so the middle class has been completely eroded. You can't buy sovereign debt, you can't go into the stock market because as I laid down before the Q ratio, total Market Cap GDP, median PE ratios are at sky high valuations. Not only that but the underlying earnings and economic growth as anemic as it is, all factitious it's based on zero percentage rates. So for my money, you have to have a strategy that both hedges against inflation and deflation, you want to own commodities, you want a shot at certain markets, certainly I'm sure the bond market, and own certain economies. I think Russia is a good buy down here with very low PE ratio, other than that you have to be very nimble, very quick and you have to understand that the economy on a global scale will have wide swings between inflation and deflation and you have to have to hedge for both. Mike Gleason: Excellent stuff Michael we really appreciate your insights and thanks for being so generous with your time it's always great to talk to you, and I hope we can do this again things I figure, will get very interesting down the road. Michael Pento: Thank you Mike. Mike Gleason: Well that will wrap it up for this week, thanks again to Michael Pento of Pento Portfolio Strategies, for more information visit pentoport.com, and of course check out the book, it's available on Amazon, The Coming Bond Market Collapse: How to Survive the Demise of the U.S. Debt Market. Tune in next Friday for next weekly Market Wrap Podcast, until then this has been Mike Gleason with Money Metals Exchange, thanks for listening, and have a great memorial day weekend everybody.